Fall is coming; everyone can feel it in the air. The sunets come earlier and the air is cooler. 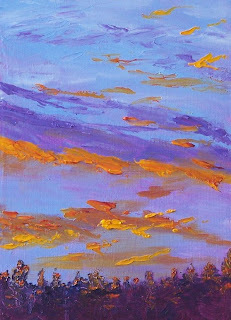 This little 5 x 7 oil painting on gessoed hardboard is based on a recent sunset viewed over the tops of the evergreen trees near my house. 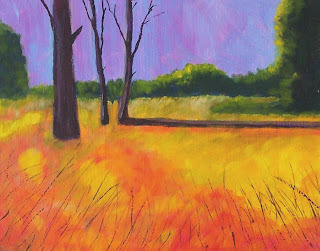 The colors of yellow, orange, and lavender are gorgeous. I hope there will be more autumn sunsets before the gray of winter sets in and hides the beauty from sight. Last week I took a late evening walk at Point Defiance Park. The sun was low, but still casting shadows and sparkling sunlight. As I walked down the path near the rose garden, this big goose and I converged. He was very polite. He stopped and waited; when he discovered that I was going to let him go first, he stepped across the path into the dappled evening sunlight. This 8 x 10 oil painting on gessoed hardboard represents our encounter. 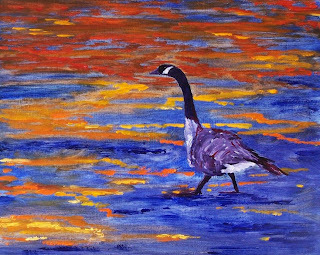 I especially enjoyed exaggerating the contrasting orange and blue of the shadows and sunlight. Once again I am thinking about the coast. 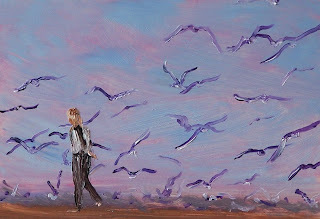 This little 3 x 5 oil painting was inspired by my observation of a young girl running down the beach directly into a huge flock of resting gulls. Of course, as she ran, the gulls startled and swarmed upward. It was a flurry of wings and feathers as the girl giggled and hooted through the mass. She exhibited pure joy in her endeavor; I'm sure the sea gulls felt differently. This is my first crop of patio tomatoes for the season. They are so sweet it is almost like eating candy. I couldn't resist painting their luscious red. This oil painting is on an 8 x 10 gessoed hardboard. Spending last weekend at Gray's Harbor in Washington State gave me an opportunity to visit the local docks. There were so many boats and all of them doing some kind of fishing--shrimp, tuna, hake--I can't remember them all. 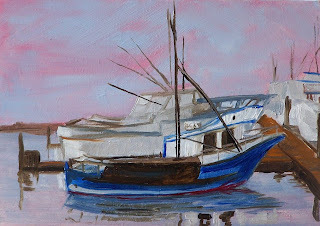 This little boat moored at the Westport Marina is a shrimp boat that was inspired by my visit. It was quite small compared to the many others that shared the dock. It was a delightful trip and I will never forget the message scrawled across the old wooden bulkhead as we entered the harbor; in huge capital letters someone had painted, "PLEASE TIP YOUR DECKHAND!" Clearly it was handpainted--a most interesting greeting. 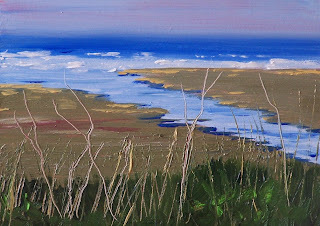 This painting is 5 x 7 oil on gessoed hardboard panel. As one of my adventures last weekend, I took the foot ferry from the North Jetty at Ocean Shores, Washington to the South Jetty at Westport, Washington. As we left the marina at Ocean Shores, the ferry took us close to Damon Point, a wild bird sanctuary where bird watchers often travel. This little 5 x 7 oil painting on gessoed hardboard is based on my view of the Damon Point shoreline from the ferry; and, of course, the falling rain. Blue sky gave way to clouds and a soft dewy rain. This past weekend I was able to travel to the Washington Coast. The weather was like fall--cool and damp, but I was able to take a walk on the beach Sunday morning. 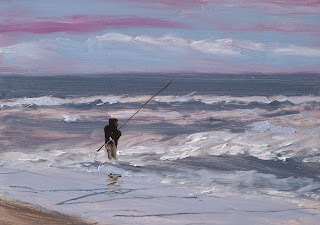 Standing in the surf was a fisherman catching one fish after another. Everytime he threw in his line, he pulled out another Perch. He had a net tied to his waist and dropped each one in as he released it from the hook. He was bundled up in a heavy parka and waders. When I spoke to him about his good luck, he simply said that some days were better than others. This apparently was a very good day. 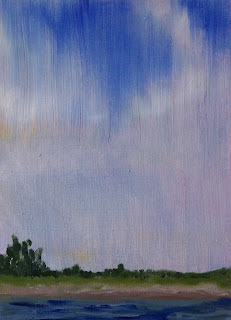 This little 5 x 7 oil painting on gessoed hardboard was inspired by my experience on Sunday morning. It is pouring rain outside this morning. It feels like an early fall. 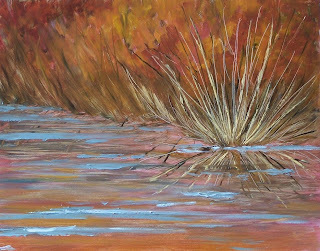 Today's 8 x 10 oil painting is inspired by the mood of fall. Pond grass turns from green to gold as summer exits and autumn takes over. This is the same reference I used for yesterday's painting, but today I painted in a more realistic mode. It is painted with fall in mind. School is around the corner and free time to paint will be lessened. 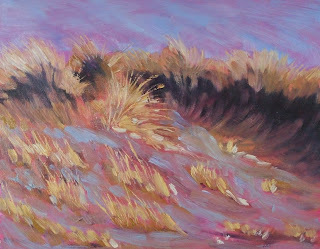 I am in mourning over the loss of my unstructured time, but I will continue to paint as often as possible as I juggle all the commitments that fall brings along with her. 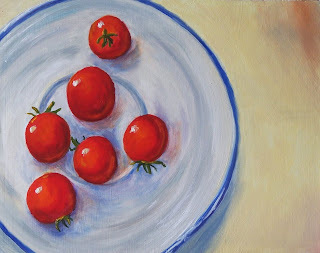 This painting is 5 x 7 oil on gessoed hardboard. I don't want to forget to post this little tree. This is a vine maple that grows at the entrance to the Snake Lake Nature Park. I actually painted it a couple of days ago, but have been busy and hadn't gotten around to posting him. 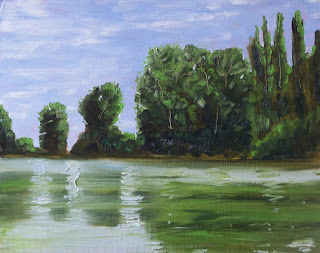 It is a 5 x 7 oil painting on gessoed hardboard. I was attracted to this little tree because of it's bright foliage which provided a strong contrast next to the darker foliage of the surrrounding trees--a bright little spot it was. Today's work is quite out of the ordinary for me, but it was absolutely fun to paint. This weekend I went to an art festival in downtown Tacoma, south of Seattle. While I was there, we sauntered across the Chihuly Glass Bridge toward the Museum of Glass and the William Traver Art Gallery. There is a wonderful little viewpoint above the glass museum that overlooks the courtyard and provides a view of the marina and Mount Rainier. As I snapped pictures of all the sights, I happened to glance down just as this man walked beneath us toward the museum. 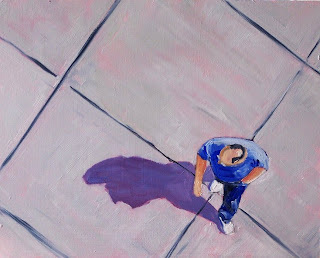 What captured my attention was his stark shadow on the concrete and the crazy foreshortening that took place as he walked. So, I snapped a quick picture and he became the subject of today's painting. This is an 8 x 10 oil painting on gessoed hardboard. 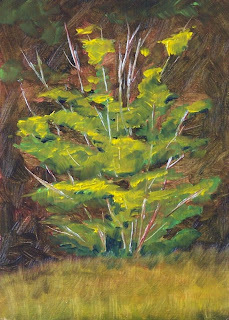 This little tree painting is 5 x 7 on gessoed hardboard. It is based on a tree that grows next to the parking lot of the Snake Lake Nature Center in Pierce County, Washington State. I'm not sure what kind of tree it is. Its bark looks like a Madrona, but it is much smaller and more compact than other Madronas I've seen. The Nature Center has many native plants growing near the park entrance. It is a delightful place to take a walk; I go there often. 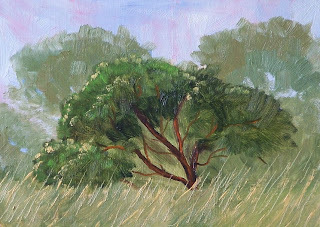 This little painting is a 5 x 7 on gessoed hardboard. 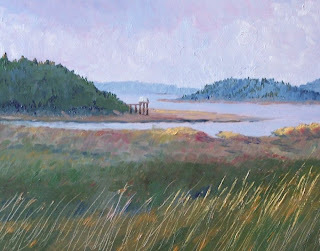 It is based on a photo I took on the Washington State coast where a river enters the Pacific Ocean. I stood on the roadside and looked over the guard rail through some brush to get the picture. Last Saturday I went for a bike ride. The weather was perfect in that it was cool, but not cold. As I turned a corner, I crossed paths with these two sweet little fawns having a snack in a field. They were kind enough to pose for me while I took some pictures. It was a joy to paint their family portrait. 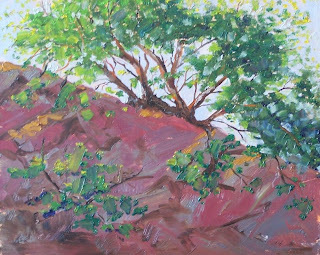 This painting is 8 x 10 on gessoed hardboard. 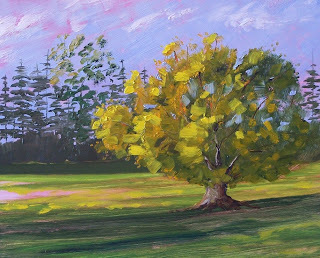 This beautiful summer tree is painted in oils on a 8 x 10 gessoed hardboard. It is inspired by a huge maple tree in a park near my house. I call it the picnic tree because people love to sit under it from early spring through fall, spread out a blanket, and have a picnic. It is one of those trees--big, old, and familiar. 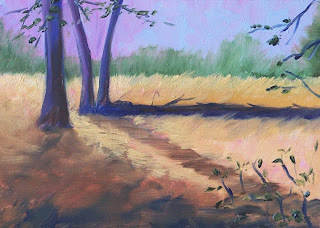 This particular rendition was based on a photo I took early one evening when the shadows were getting long and families were out strolling. 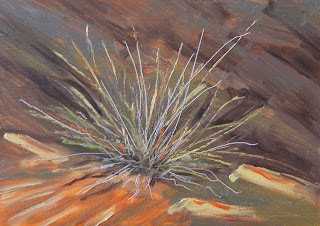 This is a very simple little study of a tuft of grass. It was fun and quick to paint. I started with wash of cadmium orange. With ample turpentine it didn't take long for the wash to dry. Then I created rocks behind the tuft from the paint left on my palette from the day before--it was a nice gray toned muddy color. I added a little asphaultum brown to darken some crevaces. 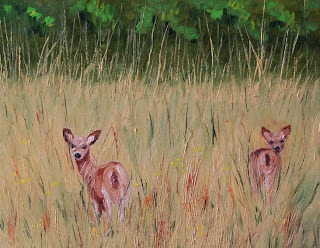 After the background was created, I completed the tuft using Naples yellow on a script brush and scatching in some with my palette knife. The foreground is mostly the orange wash showing through. Touches of Naples yellow added the sunlight. A very quick forty minute painting. This is another view of part of the Nisqually Delta. It is a fabulous place with so much natural habitat. Here is a link to a story in the Seattle Post-Intelligencer about hiking in the area and how to get there. Because of the typically mild climate of the Pacific Northwest, it is a great place for year around hiking and it isn't too late to take a visit this last month of summer.